The Kentucky Horse Park – hands down one of the most beautiful venues in the country. To show, visit, take a tour and more. Where else can you meet Kentucky Derby winner Funny Cide, take a trail ride, and watch mini horses trot alongside golf carts all in one day? The horses – some of the world’s best athletes take the stage on Rolex weekend. They aren’t just masters of one discipline, but they are masters at three. Some days, I’m not even a master at trot poles! The competitors – 75 riders who have dedicated every minute of their lives to getting to this event. Their grooms, trainers and support systems – every member of their team. It’s awesome! How can you not admire these riders? They are jumping fences taller than the average man! That takes some serious guts! The shopping – no horse event is complete without shopping! Almost 200 vendors fill the Covered Arena. If you are there, be sure to visit some of our friends, including Annie’s Equestrienne Apparel! Live streaming - if you can’t make it to the event this year, technology will allow those of us who have to work to watch it at our desks! 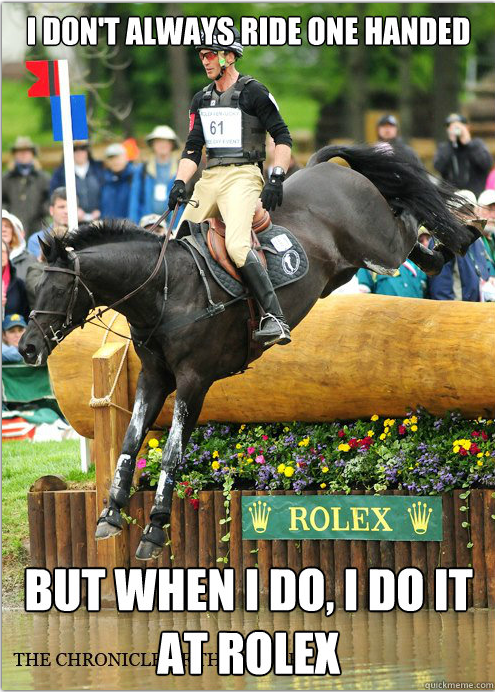 The USEF Network has us covered! Just be sure your boss isn’t hovering… or, if they like horses too, maybe you can stream it in your conference room! The fans – everyone is like you! Love the horses, love the sport, have a favorite horse/rider! More than 7,200 fans took in dressage on the first day, and the excitement will only build through the weekend! You can literally talk horses to anyone, everywhere you go! The fashion – casual to classy, equestrians are dressed the part! Big hats, boots, fancy belts and bags, the people watching is great! On jog day, our favorite riders were dressed to the nines! But as always, don’t forget the sunscreen – it gets bright out there on the XC course! Good luck to all the riders this weekend! What are your favorite things about Rolex? ?